Atherton, Los Altos Hills, Palo Alto, and Ross ZIP codes are among the five most expensive places to purchase a home in the U.S. this year. Nine of the 20 priciest U.S. real estate markets are located in California. Homes in Atherton and Los Altos Hills are staying on the market for longer than they did at the same time last year. In what will come as little surprise to anyone who regularly follows Bay Area real estate, four local communities rank among the most expensive real estate markets in the country this year. That’s according to Forbes’ annual list of America’s most expensive ZIP codes, which uses a 90-day rolling average for the period ended Oct. 27 and includes both single-family homes and condominiums. 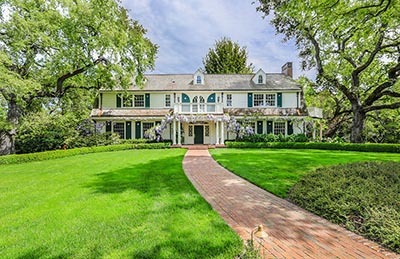 Atherton‘s 94027 is once again the nation’s most expensive place in the U.S. to buy a home, with a median sales price of $9,686,154. The San Mateo County city had held that title for several years running before losing it to Manalapan, Florida last year, which took the No. 2 spot on this year’s list. After ranking in the eighth position last year, Los Altos Hills‘ 94022 ZIP code moves up to No. 3 in 2017, with a median sales price of $7,775,000. Palo Alto‘s 94301 ZIP code, where the median sales price is $7,016,631, rocketed up the list 44 spots from last year to land at No. 4. In Marin County, Ross‘s 94957 ZIP code rounded out the country’s top five priciest real estate markets, with a median sales price of $6,939,423. Forbes notes that Silicon Valley‘s well-documented inventory shortages and highly paid tech workers are the two main factors that make the region so expensive. All four of the Bay Area cities that landed near the top of the list have less than 30 homes on the market, a situation that Michael Simonsen of Altos Research — the company that provided data to Forbes — says could get even tighter if the tax plan that the House of Representatives recently passed becomes law. Pacific Union’s Silicon Valley Vice President David Barca agrees that taxes can discourage homeowners in the region from selling, further exacerbating inventory shortages. “Atherton is full of older adults who feel trapped by potential capital-gains taxes and/or the portability of their property-tax base who would otherwise gladly sell their larger home to downsize into something more manageable,” he says. In typical fashion, New York and California accounted for the lion’s share of the nation’s 20 most expensive real estate markets. Golden State ZIP codes took nine of those spots, including 90210 in Beverly Hills (No. 8), 94010 in Hillsborough (No. 11), 91302 in Hidden Hills (No. 13), 94062 in Woodside (No. 15), and 90077 in Los Angeles (No. 20). The median sales price in all of those ZIP codes is more than $4.5 million. While home prices in the nation’s most elite ZIP codes are still sky-high, Forbes notes that the time properties take to sell has increased from last year, which may indicate a softening at the upper end of the market. In last year’s study, homes in Atherton spent an average of 151 days on the market, compared with 190 this year. Similarly, homes in Los Altos Hills left the market in an average of 105 days, more than three weeks longer than in 2016.